Annie M. Meyers was born in 1871 in Buffalo, New York. She came of well-to-do stock, her mother being first cousin to industrialist Jay Gould. After marrying US naval officer Victor Meyers, the couple settled in Chicago. Annie Meyers was appointed an alternate member on the Board of Lady Managers of the World’s Columbian Exposition in 1890, one year after Captain Meyers died. Annie Meyers’ memoir Eight Years in Cocaine Hell was the result of an addiction to cocaine which began with her innocently taking Birney’s Catarrh Remedy (largely comprised of then-legal cocaine) in 1894 – a step which swiftly led to financial ruin, a career of crime and a terrible deterioration in physical and mental health. Nonetheless, and with the aid of her sister and the St. Luke Society in Chicago, she recovered from her addiction, regained her health and much of her position in society, before her death in 1914. 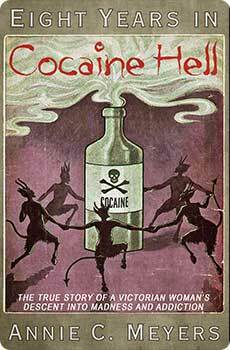 Eight Years in Cocaine Hell was published in 1902 and is viewed by historians as the first memoir of addiction to be written by a woman.